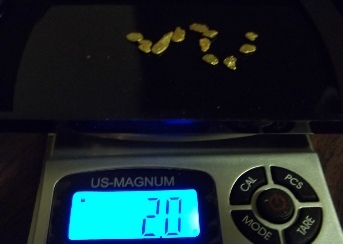 ONCE YOU PAN OUT THIS PAYDIRT YOU WILL GROWL “KEEP AWAY” AND GRIN - IT’S YOUR GOLD. The Old Timers were getting flower gold at the surface in the Porcupine but the area is covered with big trees and ground vegetation so they thought the overburden would be thick. They were wrong. The ground vegetation is only about 2 feet thick. The tree roots spread out instead of going deep and they lock together with the surrounding tree roots which gives them stability. Underneath that vegetation and those big trees are rocks, sand, gravel and yes, GOLD along with other precious metals and minerals. 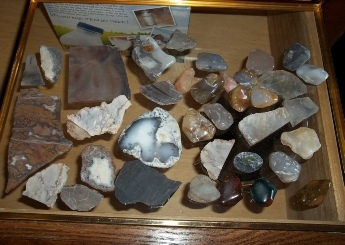 Several year ago Mac and Monica bought a business property a “stone’s throw” from the Porcupine, Willow, Cottonwood and Kennedy creeks and at times they would walk the surrounding state land and creeks with a shovel, bucket, rock pick and gold pan. Mac and Monica were getting gold within a foot or two from the surface in the creeks and up on the mountains. 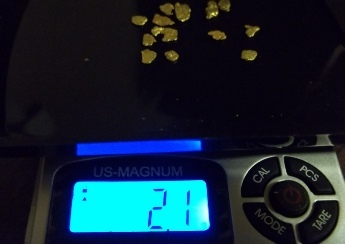 Mac contacted the state and found out that there was some small scale mining in the past up the side of the mountains in the area. Was this because they were above the tree line with very little overburden? The biggest piece of information was that the land could be staked as mining claims. Needless to say, they staked the claims. Back in the late 1800’s and early 1900’s thousands came to Alaska and the Yukon Territory in search of Gold. Some of these Old Timers made their way to Slate Creek, Miller Gulch, Nabesna and Porcupine Creek which are in the same area. 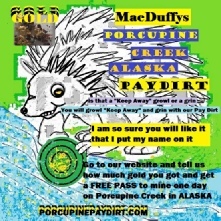 Those Old Timers knew that the mining season in Alaska is only 90 to 120 days, the winter is long and cold plus warmth and food is hard to come by so they would test and move on if there was not a lot of gold in a pan of pay dirt. 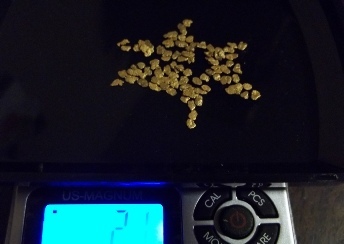 Plus, if it was covered with trees and vegetation it was much harder to get to the gold. They were looking for an easy spot to dig with a lot of gold so they actually skipped over and never mined some really good areas. Porcupine Creek area is one of those areas that they skipped over. BIRTHDAYS, ANNIVERSARIES, GOLD PANNING PARTY OR YOU NAME IT!